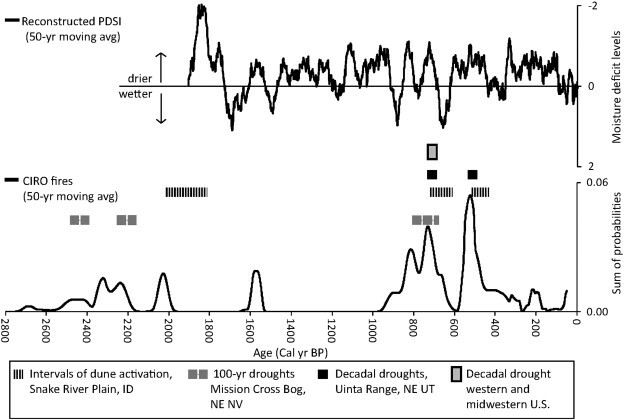 A paper published today in Quaternary Research reconstructs drought and fire activity in Idaho during the Holocene and finds droughts have been relatively less common and rainfall less variable over the past century in comparison to the past 1,900 years. In addition, the paper finds fires were more common ~900-400 years ago in comparison to the past century. Contrary to the claims of climate alarmists, the paper finds fire activity is more common during wetter periods compared to drier, due to the denser vegetation and more variable climate. The paper adds to many other published papers finding there is nothing unprecedented, unusual, or unnatural about present day drought, extreme weather, and fire activity. Reconstructed Palmer Drought Severity Index [PDSI] shown in top graph shows extreme drought and extreme rainfall were more common prior to the 20th century, and the Idaho climate more variable prior to the 20th century. Reconstructed fire activity in bottom graph shows fire activity was more common during wet periods and during periods prior to the 20th century. Horizontal axis is years before the present [BP]. Fire and vegetation records at the City of Rocks National Reserve (CIRO), south-central Idaho, display the interaction of changing climate, fire and vegetation along the migrating front of single-leaf pinyon (Pinus monophylla) and Utah juniper (Juniperus osteosperma). Radiocarbon dating of alluvial charcoal reconstructed local fire occurrence and geomorphic response, and fossil woodrat (Neotoma) middens revealed pinyon and juniper arrivals. Fire peaks occurred ~ 10,700–9500, 7200–6700, 2400–2000, 850–700, and 550–400 cal yr BP, whereas ~ 9500–7200, 6700–4700 and ~ 1500–1000 cal yr BP are fire-free. Wetter climates and denser vegetation fueled episodic fires and debris flows during the early and late Holocene, whereas drier climates and reduced vegetation caused frequent sheetflooding during the mid-Holocene. Increased fires during the wetter and more variable late Holocene suggest variable climate and adequate fuels augment fires at CIRO. Utah juniper and single-leaf pinyon colonized CIRO by 3800 and 2800 cal yr BP, respectively, though pinyon did not expand broadly until ~ 700 cal yr BP. Increased fire-related deposition coincided with regional droughts and pinyon infilling ~ 850–700 and 550–400 cal yr BP. Early and late Holocene vegetation change probably played a major role in accelerated fire activity, which may be sustained into the future due to pinyon–juniper densification and cheatgrass invasion.